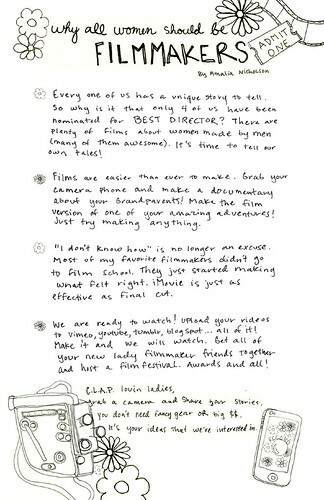 Preview Issue Materials: Amalia Nicholson's Charge for Female Filmmakers! One of the lessons that has come out of doing the preview issue has been figuring out how to ensure proper printing—especially when we need to rely so heavily on the crappy free printer I got when I purchased my computer five years ago. It was super disappointing to see articles that women laid out themselves not translating well in the printing process, as was the case with Amalia Nicholson's piece encouraging women to pick up the camera. While we were able to get the words to come through, it still bums me out that Amalia's adorable little line drawings were too light to see in our printed publication. Not all is lost, however, as we have this magical thing called the internet! So, as promised, here it is, in all it's glory, Amalia Nicholson's "Why All Women Should be Filmmakers"! 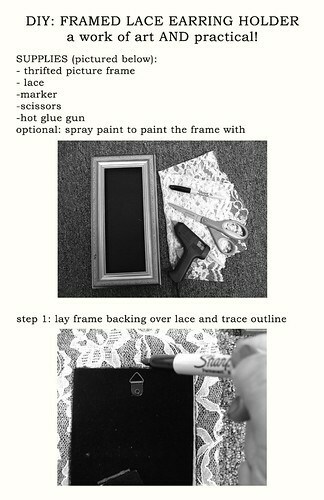 As promised, here is the full tutorial of Lisa Nguyen's Framed Lace Earring Holder. Lisa was awesome enough to take the reigns and lay out this piece by herself, but as we were tight on space for the preview issue, I asked her to shrink it down for publication. What she had laid out was so nice, however, that we have to share it somehow! If you are a bit more crafty than me (I lack the patience) and have a fun DIY project you would like to share with C.L.A.P., email creativeladiesarepowerful@gmail.com ! We are always looking for interesting activities to share with readers! 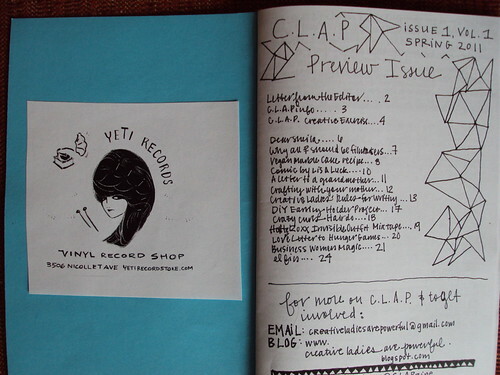 People have been asking where/how to get the preview issue of C.L.A.P.—as of today it is available for sale at Yeti Records and the Uptown Everyday People Clothing Exchange (on Thursday, we will have it at the St. Paul EPCE). 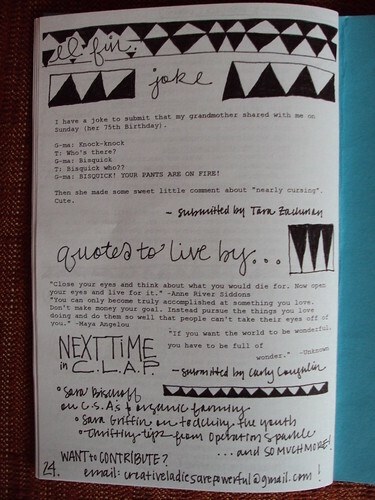 I am hoping to get the zine up on etsy sometime this week, but time is running out and I am leaving for a weekend in Chicago (visiting our very own Jackie Katers, who contributed a delicious vegan marble cake with vegan chocolate butter cream recipe for our preview issue). So stay posted! In the meantime, check out some fabulous photography featuring the preview issue (stay tuned for actual articles from the zine) and our contributors' bios! Letter from the Editor + F.A.Q. 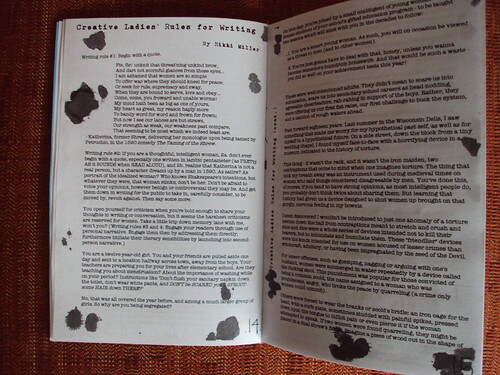 Nikki Miller's "Creative Ladies' Rules for Writing"
...I really, really hope I am not forgetting anyone! If am, I am sorry! Please remind me of your smiling face so I can give you a proper thank you! And there is NOTHING quite like flying by the seat of your pants to get it all done! Tomorrow (well, today) is the T.A.C.I.T. 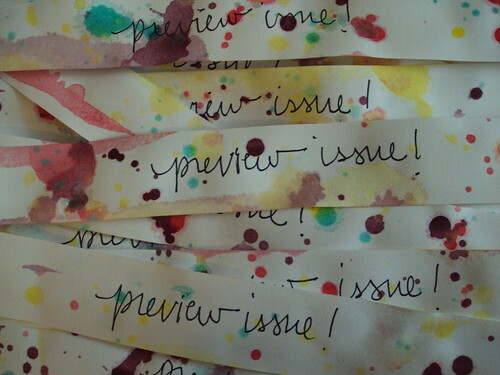 Handmade Heartfelt fair, where the preview issue will be unveiled and I couldn't be more excited! There are still a few loose ends to tie up, but overall, things are moving along swimmingly and the zines are looking great! Stay posted for a bit more on our very successful assembly party at Yeti Records last night, as well as some sneak peaks at the content and a bit more about our contributors (look out for our special Contributors page, coming very soon!)! I learned a lot of things putting together this issue, but the one that sticks out of my mind the most is that in scrapbook speak, these are called "belly bands." Which sounds kind of gross to me. But they are gonna be super cuuuuuute, especially once I purchase some tape to adhere them tomorrow morning (as it turns out, glue sticks are not the best adhesive). 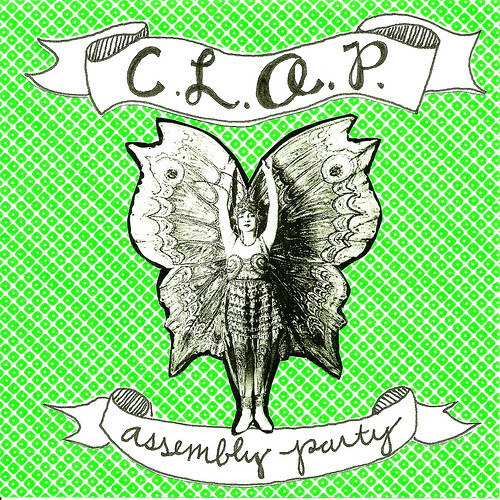 The official C.L.A.P. stamp. Handmade, because even though craft stores have rows upon rows of stamps of screaming bears, lily bunches and children playing joyfully,there are very few letter stamps, and even fewer good ones. 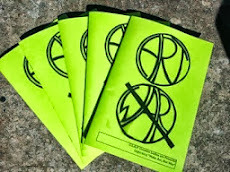 Just stamped zines. 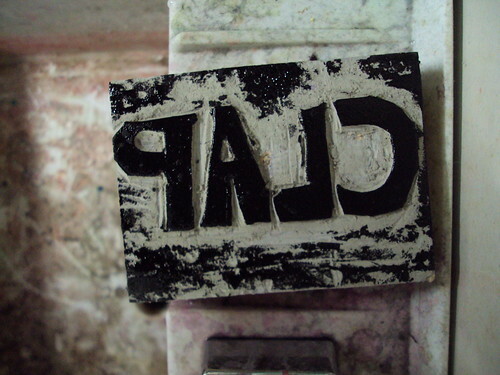 Some of the stamps worked better than others, but that is part of the DIY aesthetic, I suppose. Still, I can't believe how great they look! I am completely blown away by how awesome the collage covers look thanks to the ladies that attended our assembly night! Can't wait to share more later! But for now, it is time for some serious shut eye (right after I go print off a tax form for tomorrow's fair. ick.). Oh! 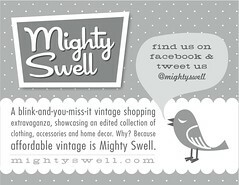 And of course, if you are able, come stop by the Operation Sparkle/Fashionasty booth tomorrow at the fair. 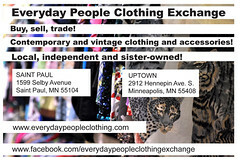 We will have great thrifted fashions AND C.L.A.P. 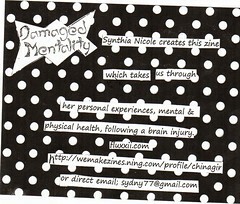 for sale (and, if Jake actually gets to Kinkos at 3 am after a viewing of Scream 4, a zine that he has produced as well!) Goes from 11-6 at the VFW on Lyndale in MPLS. Hope to see you there!!!!! I am so very, very excited about everything we have going on here at C.L.A.P. Headquarters (otherwise known as my living room)! We finally have the details ironed out for the first ever C.L.A.P. assembly party! The event will start at seven p.m. on Thursday, April 21st. 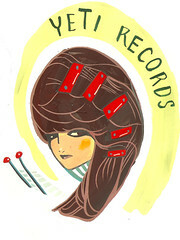 Lisa Luck, of Yeti Records, has been awesome enough to offer the store's basement as a space for the event. We will be assembling the zines, as well as making simple collages for the covers, so bring any scissors, magazines/books to cut images out of, and glue sticks you may have laying around the house. Light refreshments will be served, but feel free to bring any beverages and/or snacks you would like to share! For more details and to R.S.V.P., check out the Facebook invite. 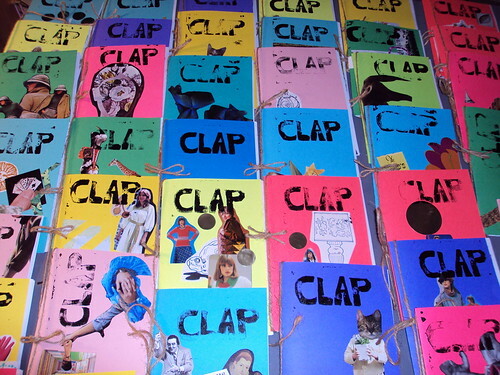 Also, I am really excited about tomorrow for several reasons, one of which is that I am planning on venturing to Anchor Paper in St. Paul to pick up what will some day be the guts, covers and promotional materials of C.L.A.P. I might even get a stamp or two, who knows! Can't wait to see what I find! Now off to some relaxation and popcorn! Mojitos and More Things to Look Forward to! Great things are happening at the haus of C.L.A.P.—preview issue planning is in full swing and we will soon have all the details regarding our first ever assembly get-together at Yeti Records on Thursday, April 21st! Today was so beautiful, however, work could not take the whole day away, especially since my great friend (and future C.L.A.P. contributor) Jackie Katers was in town. To commemorate this special occasion (visitor + 60 degree temps), I had to celebrate with the most springy/summery thing I know—mojitos! Now, it has come to my attention that my summer drink of choice has gained a lot of popularity since I first started squandering my money on limes and fresh mint back in Brooklyn six years ago. This sort of surge in popularity has both its positives and negatives—on one hand, mojitos are more readily available at fine dining establishments. On the other, we have been assaulted by a whole slew of faux mojito products, in the form of powders and liqueurs that sully the name of the most fabulous adult cocktail known to (wo)man. instead of this (Chris' mom gave this to us. 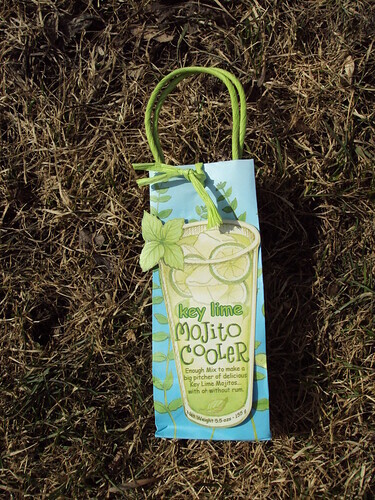 I was able to use the muddler than came with it, but can not figure out how (or why) someone could sell this powder for TEN DOLLARS while still instructing the drinker to add limes, fresh mint and (if you feel like it), raw sugar (otherwise known as the major ingredients of a mojito). )—I present you with a C.L.A.P. 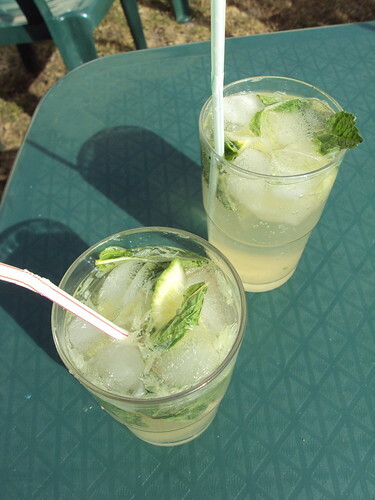 web exclusive recipe, Holly's Mojitos! 1. Add sugar (be as liberal or conservative as you feel necessary, though I usually do about a tablespoon), 2 slices of lime, about 4-5 mint leaves and 1 and a half shots of rum to a nice, shiny, clean glass (I always feel fancier drinking out of clean, shiny glassware). "Muddle" the contents using a muddler or, if you aren't privy to a muddler, a wooden spoon or some other blunt-ish object. Make sure the leaves and lime pulp are good and mashed with the sugar and booze. 2. Add ice cubes (as Chris says, "they make the drink") and enough sparkling water to fill the glass. Stir and enjoy with your straw! 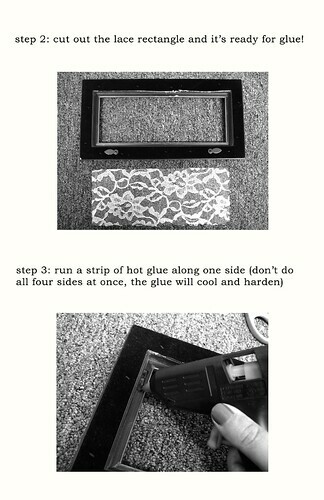 See, wasn't that easy (and million times better than a mojito mix?)? I'm so excited by all the fabulous feedback and energy I've been getting from ladies who want to be part of this project! 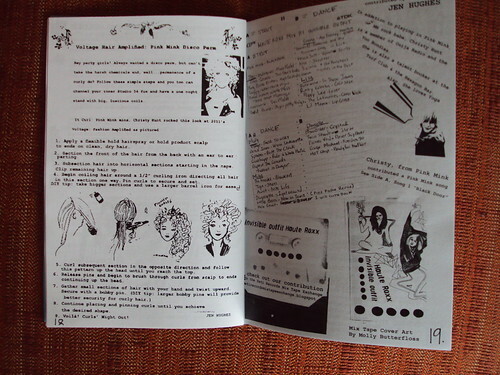 Though I was a bit worried that the April 20th deadline for the preview issue would scare people off, so many wonderful women have said they can contribute to the zine by that date! VERY exciting! 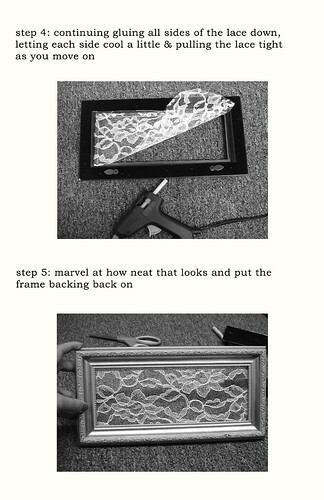 Also very exciting—Operation Sparkle (the thrifting blog I run with my great friend Laurie Marman) and Fashionasty (the fabulous Jake Thompson's blog) will be selling the preview issue at the Handmade Heartfelt fair on April 23rd in Minneapolis! The event takes place at the VFW on Lyndale from 11-6, so hope to see you there (we will also be selling fabulous thrifted gems, so if your closet needs some spice, this is the place to be!)! Lisa Luck of Yeti Records has also been awesome enough to not only do a ton with the zine but to also offer to sell it at her shop! So look for the preview issue at Yeti starting April 23rd! Also, the new and improved facebook page for C.L.A.P. 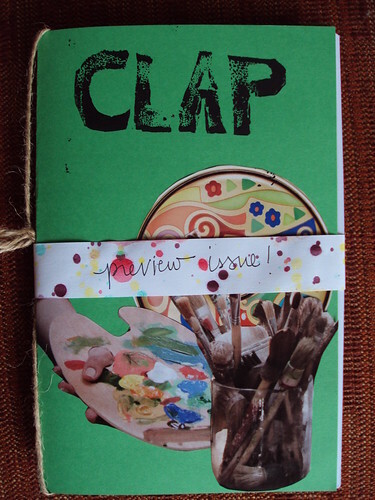 and brand new twitter account @CLAPzine are now up and running! Very exciting stuff. In addition to chatting with fabulous ladies about this new adventure, I have been thinking about the C.L.A.P. of the past, and what about it was so great that it still, to this day, lingers with so many of us. 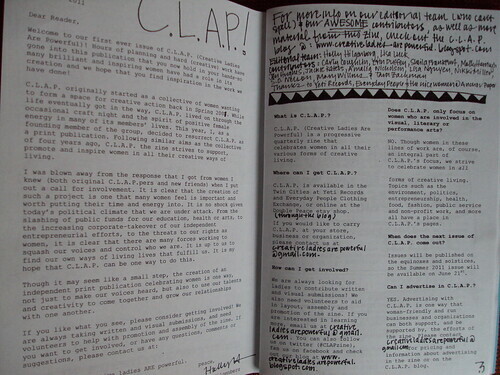 While these pieces might not wholly sum up what made the original C.L.A.P. collective so special, I think they do embody some of that excited energy! 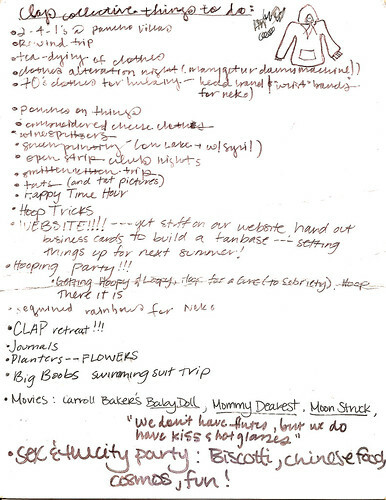 A piece of cardboard, way back from Spring of 2007 that I have been holding on to (and was actually propped up on our kitchen counter for, well, over two years now) that contains some of the initial plans of C.L.A.P. (you may notice, they mostly involve "fun" activities and dressing my dog up in various outfits). My "vision board" we made during one special C.L.A.P. meeting. 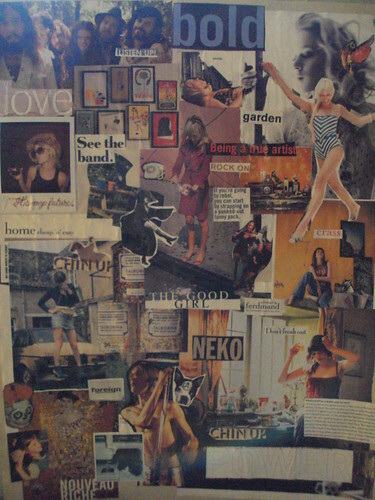 Even back then, we knew vision boards rocked. This one currently makes its home in my dank basement studio. It still touches a special place in my heart. Here is to positive women energy!